Exclusive at Fantasy Glassworks only!!! Are you in the Rockford, Illinois area and want something really special on a bottle or other glass? Aside from our large selection of glass and crystal, we can also work with your glass, be it wine bottles, jar candles, mirrors, picture frames, or anything else! The only requirement is that it must be smooth glass (or crystal), and we can put just about anything you'd like on it. The price for your piece will vary depending on size, complexity, quantity, color fill, etc... so feel free to email or call or text us with your ideas or questions at info@fantasyglassworks.com or 815-964-2080. Below are a few samples of our work, including hand-drawn artwork. Please note that we can only work on filled alcohol bottles that are local and hand delivered, we don't ship alcohol bottles (federal regulations), however you can ship us any other glass. If you'd like to ship us something please contact us before hand. Have a special event coming up? 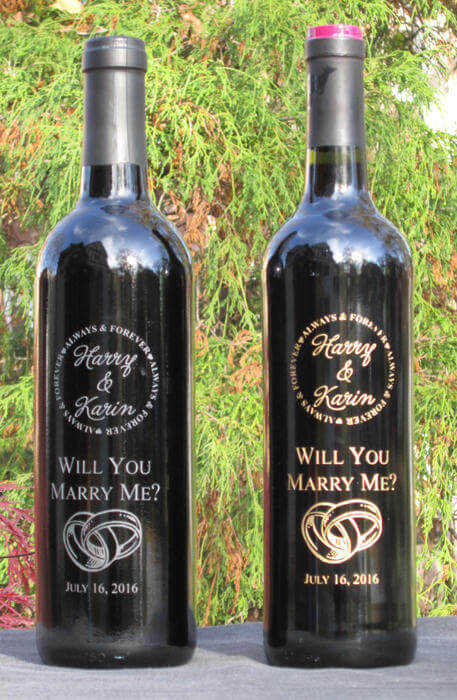 Personalizing a wine bottle, champagne bottle, or even whiskey bottles is a very nice way to memorialize your day. These are particularly popular for weddings, anniversaries, corporate events and engagements. 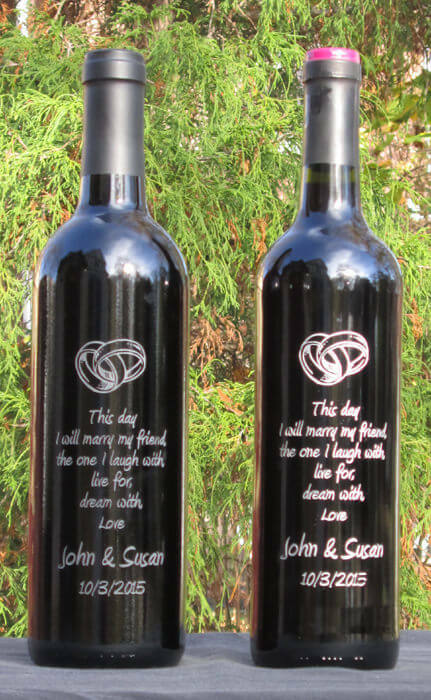 We have many stock designs, but you can also write your own poem, vows or any other text and we'll put it on your bottle. The photo to the right is an example of our work - the bottle on the right has gold color fill added, which is an additional option -- let us know what you'd like and we're happy to work with you on proofs, ideas, pricing, or anything else you may like. These bottles show one of our most popular wedding sentiment and design, this time the bottle on the right has silver color fill. For dark glass we recommend silver or gold color fill (or, as you can see no fill at all). There are several very nice wineries in the Rockford, Illinois area. We recently had a customer bring us some wonderful bottles from DC Estate Winery in South Beloit, Illinois (not pictured here). We can also work on jar candles of any size - this example has gold color fill to accent the dark brown candle. 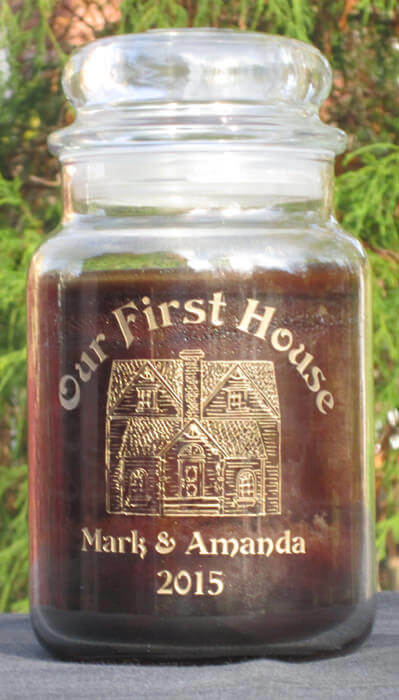 The nice thing about these is that after the candle has burned down you'll still have the jar to display or refill. Putting your (or your child's) hand-drawn artwork on any glass is a wonderful present for parents or especially grandparents! The process is simple, too: make your drawing on white paper with a black marker or pen (we recommend a medium tip Sharpie) and either scan it and email it to us or bring it to us ( snail-mail, if you're not local) and we'll scan it for you. There is no extra charge for this service and you can have it on any glass.